Anyone who has used the Williams-Sound IC-1 Interpretation console knows how dependable, durable and simple they are to use. The Williams-Sound IC-1 was introduced in 1992/1993 and was available in blue and white which was later replaced with an all black unit. Atlas Language Services, Inc. has several IC-1’s in stock and they have been our primary “go to” for the last 15 years. They are a true work horse and have always been dependable and simple to use. We take care of our gear, but these units do take some wear and tear. Our inventory gets shipped, unpacked, used and repacked. We have had them dropped, bumped, water spilled on them, the whole nine yards and yet the IC-1 continues to perform. About three (3) months ago I meet with a manufacturer’s representative for Williams Sound who wanted Atlas to try out the IC-2 on our next simultaneous interpretation project. Now, Atlas is an authorized dealer/reseller for the Williams Sound brand and are proud of what Williams Sound offers. 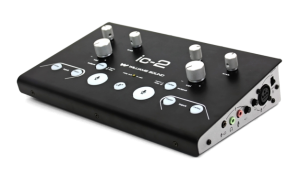 However, we weren’t ready to replace our old dependable IC-1’s with the new IC-2’s just yet, so we took Williams Sound up on their offer for a demo of the IC-2… Here are our thoughts! The Williams Sound IC-2 is an audio control center for simultaneous interpretation of one or more languages. As a stand-alone unit, it allows one or two interpreters to monitor floor or relay sources, activate microphone inputs, and route the interpretation signal to one of two language groups. Ideal for presentation-style conferences for up to 14 languages, where a floor and a single relay language are used. Can be used with Williams Sound FM, infrared and Digi-Wave™ transmitters for portable or fixed installations. Designed to meet international standards for portable interpretation consoles. The IC-2 can be summed up as: beautiful, modern, simple and clean. We immediately fell in love with the “modern” look of this unit. The black surface, color coded buttons and silver dials make this unit look and feel very contemporary. At the top of the unit, are three dials. One of each control the internal “mini mixer” (bass, treble and volume) for each interpreter. In the middle are the output buttons which light up to a nice yellow/orange color and below that are the input buttons in blue and the interpreter buttons in red. In the very middle between the two interpreter buttons is a “cough” or mute button. The dials are textured and easy to grip with black hash marks which show you the dead center. The buttons are a soft push button and are easy to feel as well as see. Solid! At 3.4 pounds (1.5 kg) this unit feels as solid as the old IC-1. We were pleasantly surprised that Williams Sound didn’t go crazy trying to lighten up the IC-2. Instead, they went for the simple approach of updating the unit but keeping the primary fundamentals intact. Power for both units is 18VDCm 1A power jack using a 2.5mm ID barrel power jack. The IC-1 does not have any switches, however, they did add switches to the IC-2. The switches that the IC-2 offers are the Norm feedthrough, Relay feedthrough, and the Ground lift. Norm Feedthrough: Routes the audio from Floor onto Norm Output when Norm Output is NOT in use. Relay Feedthrough: Routes the audio from the Floor onto the Relay Out XLR jack when Relay Output is NOT in use. Ground Lift: safely breaks the connection between chassis and audio grounds internal to the IC-2 to help technicians debug tricky ground- loops that cause hum. Both the IC-1 and IC-2 utilize an XLR (balanced or unbalanced) line feed for incoming audio which is standard. Once the floor line is connected the IC-1 and IC-2 both use standard XLR lines to transmit out to the transmitter(s). In addition, the IC-1 and IC-2 both continue to use XLR balanced lines and/or 3.5mm electrets mono or stereo plugs for headphones and microphones. Both the IC-1 and IC-2 offer XLR (balanced, line level audio) output. The IC-2 also offers an RCA jack output (no feedthrough) which can be connected to a recording device. The IC-2 offers a CAT-5 output for relay. In a relay multi lingual configuration, the language spoken at the podium will remain constant. However, it is not spoken by all interpreters. A simultaneous interpretation of a “Relay” language spoken by all interpreters is necessary. This interpretation is routed via the CAT-5 bus to all other interpreters, who interpret sequentially (Williams Sound, IC-2 manual)”. Both the IC-1 and IC-2 do a great job with the relay, however, the new IC-2 is labeled clearer and Williams Sound has eliminated the “Key Out” phrase and replaced it with the more common “Relay Out” phrase which makes it much more logical in my opinion. Add to that, Williams Sound added a CAT-5 bus for relay and this is starting to turn into a no brainer. The CAT-5 cable is so much easier to use and set up then the previous XLR lines. This allows the IC-2 to be “daisy” chained together very easily. The IC-1 has officially been discontinued and replaced by the IC-2. However, that does not mean you can’t get your hands on an old used IC-1. They appear to be selling for about USD$500 – USD$750, USED. Now the IC-2 has a retail price of $1,749.00 with a MAP (minimum advertised price) of $1,487.00. We used the demo IC-2 for three (3) consecutive days in early April 2012. Before the event was completed, we placed an order with Williams Sound for five (5) of these very impressive interpreter consoles. We had Williams Sound ship the new orders directly to the Orange County Convention Center (OCCC) in Orlando, Florida for another event that we were handling which utilized six IC-2 units daisy chained together (languages were: Spanish, Italian, French, German, Japanese and Mandarin). They were so easy to use and simple set up, we had a very successful event there as well due in part to the new IC-2. The IC-2 obviously is worthy of the “IC” name, brand and reputation. It simply exceeded our expectations and those of our interpreters and technicians. The IC-2 is a solid, dependable, simple to use and an overall great option for any language service provider (LSP), simultaneous interpreter, or event which requires interpretation and/or interpretation equipment. Add to that the mini mixer built in as well as the CAT-5 cable for relay and you have yourself an amazing interpreter console that will allow two (2) interpreters to use the unit at a very affordable price! Atlas Language Services, Inc., a Chicago based Language Service Provider specializing in language interpretation (spoken), translation (written), globalization, localization and conference interpretation and simultaneous conference equipment rentals and sales. With over 20 years of industry experience in the legal, medical, corporate, pharmaceutical, engineering and conference interpretation fields as well as expertise in written translations for advertising, marketing, promotions, sales, human resources, publications and technical research material, you can be assured that Atlas can handle all your language needs, not just domestically but worldwide. Atlas Language Services, Inc. is an A+ rated business by the Better Business Bureau as well as a corporate member of: American Translators Association; Association of Language Companies; Crystal Lake Chamber of Commerce; Chicagoland Chamber of Commerce; Midwest Association of Translators & Interpreters; Meeting Planners International; and the Illinois Paralegal Association. Atlas Language Services, Inc. can be reached at 888-816-0577 / 312-372-1600 / 815-479-1600 or online at http://www.AtlasLS.com.